Are you trying to teach banking for kids? How about general money management? One of the best ways to normalize banking in your household is to establish a family banking day. One of the ways to teach banking for kids is to normalize the banking process to them. I mean, up to this point, they’ve likely gotten used to putting coins and dollars into a money jar. Perhaps they keep some of their dollars in a wallet or a purse. But the bank? It’s probably just a place where they see their money disappear to – a few times a year, at that. Banking is going to become a big part of their lives as they get older. So, let’s talk about family finances, particularly how to establish a family banking day to help them establish their own healthy banking habits. What is a Family Banking Day? Everyone needs to go to the bank, at some point. It might not be often – thank goodness for things like direct deposit! But at some point, you’ll need something. In fact, even though I haven’t been to the bank this entire year, last week I needed to go and get some business checks so I could pay my estimated quarterly taxes to the IRS. It was the perfect time to take my almost-3-year-old. What if, instead of avoiding the bank like the plague, you establish a family banking day – a day when the whole family does a little field trip on the way home from work/school and everyone takes care of their banking needs at the same time? This would help out with several areas of teaching your kids money management skills. For starters, your kids would watch you do banking, and get comfortable with that. Not only that, but because you are consistently taking time to get to the bank and take care of things, you are showing your child that money management is a priority to you. Secondly, your child would have more opportunities/cues to put their money into their savings account. Which means more might actually make it there. And thirdly, it’s a fun family tradition. Maybe not every time. But anytime you can have a reason to get everyone in the same car and go on a little trip together is an opportunity to bond. That’s a win, in my book! Doing this will naturally bring up some great teachable moments for you. I’d like to point out several ways to use these days as money lessons for your child. How to Correct a Banking Mistake (and question authority, respectfully): Banking mistakes happen. And yes, I was the 13-year-old who went into a bank and showed them their mistake! Long story short: I noticed I was $93 short in my checking account when I was a teen. And there was NO WAY I had spent that money. So, I headed to the bank immediately. The banker was nice enough to sit down with me, condescendingly explaining that people – especially kids – overspend on their accounts all the time. I asked her to look again, and behold, she found that someone else’s check for $93 had mysteriously been taken out of MY account! Money in Savings Tends to get Spent Less than Money in Your Wallet: You might want to talk to your child about how putting money into a savings account, where it takes several days to move it to checking and get to it, means the money doesn’t get spent as easily. In fact, they might experience that as they get better about saving. Change Matters Too: Periodically have your child roll up the family’s change jar using coin wrappers you get from the bank. Then deposit them into the family’s savings account, your own, or your kids’ – your choice! This shows your child that coins really do add up. Compound Interest is Pretty Cool: As your kid gets more and more comfortable putting money into a bank and seeing savings account statements (either online or on paper), they’ll start to notice things. Like, maybe they notice they’re getting paid for their money. That’s an upgrade from a money jar! Something you’ll want to point out to them is that not only are they getting paid for their money, but their interest earnings are earning them money as well. And if you’re not comfortable explaining compound interest? Asking a bank personnel to explain it to your child is a great idea. You Can Check Your Balance at the ATM: Show them that they can check their account balance at the ATM on the receipt, or online, or by asking a bank teller. Periodically Change Passwords: Now’s a great time to teach your child the need to periodically change their online account passwords. Alright – so how do you set up banking for kids through a Family Bank Day? Schedule a Day: Choose one day a week/bi-weekly/month where everyone gets to update their banking needs by physically going to the bank or an atm to make deposits, transfers, etc. It’s best if you put it on your calendar in your family command center so that everyone knows when they’ll need to be ready for it. Explain to Your Child What They Can Do at the Bank: You’ll want to explain to your child all of the things they can do at the bank, by explaining all of the things that you do at the bank. You know, make deposits, general account maintenance, set up online banking, associate your accounts together, etc. Get Everyone a Bank Account: It’s hard to do banking if your child doesn’t have a bank account! Your first family banking day is the perfect opportunity to open a savings account for them. Take Turns Doing Your Banking: You guys can all stand in line, or line up at the ATM (try for less busy times if there will be multiple transactions). Each person gets to take their turn making deposits or withdrawals, as needed. Take Stock of Your Account Balances: Remind your child that it’s a great opportunity to see how their savings account is growing. 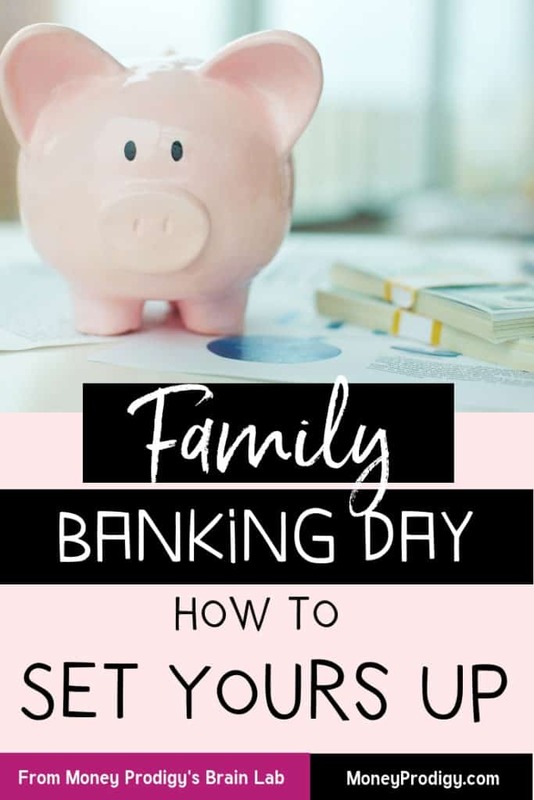 Bonus: since your kids know that a family banking day is scheduled into each week, every other week, or each month, then they’ll start to learn to plan some of their money handling needs out ahead of time. It’s likely you won’t have chores to do at the bank every other week, or even every month. And that’s okay. In fact, some of your family banking days might just be you driving by and when you get close, asking if anyone has any banking needs to take care of today. If the consensus is “no”, then just keep on truckin’. Roll up change and deposit it. Open someone a new bank account. Close down an old bank account and move the money over. Take care of business banking needs. Get change for things you need to pay cash for. Open up a savings account for your family savings goal. Other variations you can do: choose a family digital banking day, where everyone learns how to use their bank’s app to deposit checks and views their statements online, from home. These things certainly aren’t going away, so it’s good practice for them. Also, don’t be afraid to make several of your family banking day trips ATM trips, with you guys depositing and withdrawing on different accounts as needed. Remember, banking for kids is all about normalizing the banking process for them – something Family Banking Days will surely do.